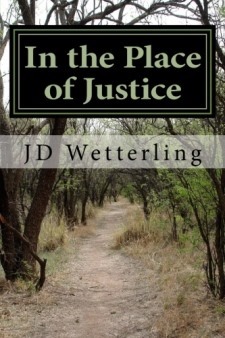 Unlike John Bunyan’s 17th century pilgrim, who fled the City of Destruction for the Celestial City, JD Wetterling’s 20th century pilgrim is reverse-wired. He’s an unwilling pilgrim dragged toward the Celestial City while doggedly fighting to return to the City of Destruction. IN THE PLACE OF JUSTICE is an adult Christian worldview novel about a wealthy financier who lives large on a sailboat but has an empty soul. He struggles under a heavy burden, from Chicago’s futures trading pits—capitalism’s octagonal altars to the goddess of greed—to the Vanity Fair of Washington DC and slothful Sarasota to the poverty-stricken, saint-inhabited mission fields of Haiti. Jack’s pilgrimage through a fallen world meets tribulation with every step, and then he’s forced to run for his life from an evil man sworn to kill him. It’s an action/adventure, love-at-all-levels story for the ages. Here’s how this story came about: Since I don’t find book research all that much fun, the settings in this novel are all places where I’ve spent various periods of my life—uncommon, even exotic places, to be sure. Sailboats have been my passion, along with airplanes, since adolescence, and I’ve owned, enjoyed, and terrified myself with both on more than one occasion. They play a key role in this story. After my fighter pilot days, I spent 7 years at one of planet’s largest commodity futures exchanges in Chicago as a trader/broker in the organized chaos of the trading floor, and was elected a member of the exchange board of directors. A fictional re-creation of the exchange is the foundational setting of this novel. I spent a fair amount of time on Capitol Hill, representing the industry’s interests in Washington DC, also a significant venue in this story. The supercharged air one inhales in that center of the universe intoxicates the power-hungry souls who gather there, some of whom (imaginary), make an appearance in this tale. I then lived for over a decade on the delightful, slothful shores of Siesta Key, Sarasota, FL, the opening scene in the story. While living there I sat on the board of a small non-profit that flew mail and supplies to the missionaries in Haiti. It was on flights to that poverty-stricken, saint-inhabited island that I learned what real Christians do with their lives. I’ve been wrestling with my conscience ever since about how I’ve squandered my allotted days, the vast majority of which have been exceedingly self-centered. All that was needed to create a fictional drama out of these fascinating places were some interesting characters who could inhabit them, so I ransacked my soul and found some. There are varying degrees of the author in all of these characters, from the lovable to the loathsome. Then I just tried to keep up with them on my keyboard as they went about their “lives.” What I ended up with was a beginning, a middle, and an end, and that’s what makes a story. A writing professor at the University of Iowa Writers Workshop said, “For the writing to be good, the reader must be able to feel the pressure of the soul behind the words.” IN THE PLACE OF JUSTICE grew out of such pressure. Deo volente, you will feel it, too. Go to Amazon, click on “Look inside,” and read the first 2.5 chapters.